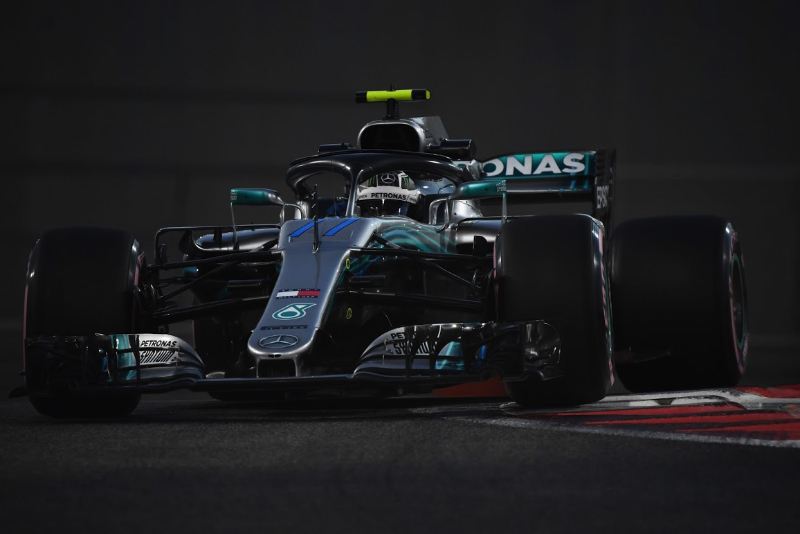 Mercedes driver Valtteri Bottas set the fastest lap time during the sunset simulations in Free Practice 2 for the Abu Dhabi Grand Prix. FP2 on Friday and qualifying on Saturday both were scheduled to start at 5:00 p.m. local time. Sunset was at 5:34 p.m. So that was when track temperatures cooled and lap times improved. The line-up for the weekend was: Mercedes – Lewis Hamilton and Bottas; Ferrari – Sebastian Vettel and Kimi Raikkonen; Red Bull TAG Heuer – Daniel Ricciardo and Max Verstappen; Racing Point Force India Mercedes – Sergio Perez and Esteban Ocon; Williams Mercedes –Lance Stroll and Sergey Sirotkin; Renault – Nico Hulkenberg and Carlos Sainz; Toro Rosso Honda – Brendon Hartley and Pierre Gasly; Haas Ferrari – Romain Grosjean and Kevin Magnussen; McLaren Renault – Fernando Alonso and Stoffel Vandoorne; Sauber Ferrari – Marcus Ericsson and Charles Leclerc. "I've always gone well here, with two poles and a win in GP2," Gasly said the 3.451-mile (5.554 km) 21-turn Yas Marina circuit. "It was at this track that I clinched the GP2 championship title. So I like the track and it's always a special feeling when you are racing in the dark. "As for the track itself, it provides some challenges, especially in the final sector, which is very technical with many changes of direction where you need to get into a good rhythm. So the circuit has two distinct characters, with the first two sectors featuring long straights and high speed long turns. But it's that final technical part I like best and it's where a driver can make a difference." The fastest driver in FP1 was Verstappen who clocked a 1:38.491. The Williams drivers were the first out in FP2. The ambient temperature at the start of the 90-minute session was 79 degrees Fahrenheit (26 degrees Centigrade) and the track temperature was 86 degrees Fahrenheit (30 degrees Centigrade). Raikkonen ran the super softs to set down the earlier mark and 1:40.224. Others were running the super softs as well as the teams and drivers checked out their race set ups. Bottas got down to a 1:38.600 as the track cooled. Sunset was at 5:34 p.m. local time, so 36 minutes after FP2 began. Verstappen moved into the runner up spot, 0.242 of a second off of Bottas, before banging over the curbs and doing some damage to the floor of the Red Bull. As the half-hour mark approached the drivers started to do some fast runs on the hyper softs. Ricciardo, on a used set, went ahead with a 1:38.582, which was 0.018 of a second in front of Bottas. Then Raikkonen put on a new set of hypers to do a qualifying simulation and cut the best down to 1:37.461. This was around the same time of day the real qualifying runs would be happening on Saturday. Vettel's attempt put him within 0.108 of a second behind his teammate. "As the sun sets…track temperature falls dramatically: this is one of the peculiarities of the circuit, meaning that drivers are often chasing a moving target," Pirelli tweeted. Grosjean and Hulkenberg grabbed third and fourth as the qualifying sims continued. But now, a couple minutes past sunset, both Mercedes drivers were on track. Bottas took the lead with a 1:37.236, 0.207 of a second ahead of his teammate. Now it was Verstappen's turn. He had traffic as he displaced Hamilton in second, which was 0.052 slower than Bottas. Just before the midpoint of FP2 Ricciardo tried his qualifying sim, and got sixth place. Verstappen improved to get within 0.044 of a second of Bottas. Then Ricciardo improved to third, 0.192 slower than Bottas. So the order was now Bottas, Verstappen, Ricciardo, Hamilton, Raikkonen, Vettel, Grosjean, Hulkenberg, Magnussen and Ocon with just over 30 minutes remaining in the session. As usual, the teams used the last half hour of FP2 for long runs and race preparation. So the top 10 remained unchanged.